Breathlessness or shortness of breath is a common presenting complaint to the Emergency Department (ED). There are a large number of causes for this presentation and several medical terms used to describe it (see below) but no concise definition. It is described as a subjective feeling of difficult or uncomfortable breathing or a feeling of not getting enough air. Dyspnoea is an overall term used to describe an unpleasant awareness of increased respiratory effort and will be used synonymously with breathlessness in this session. Tachypnoea describes a respiratory rate greater than normal (which varies with age in childhood and is 14-18 breaths per minute in an adult). Hyperpnoea describes a greater than normal level of ventilation (minute ventilation) which may be normal to meet metabolic requirements (eg. during exercise). Hyperventilation describes a situation where over-breathing results in a lowering of alveolar and arteriolar PCO2; in this situation, minute ventilation exceeds metabolic demand). Orthopnoea describes breathlessness on lying flat. It is due to redistribution of blood leading to an increased central and pulmonary blood volume and to abdominal contents pressing against the diaphragm in the recumbent position. Paroxysmal nocturnal dyspnoea describes a sudden onset of dyspnoea usually occurring at night and waking the patient from sleep; the mechanism is similar to orthopnoea but the sensory awareness of the developing situation is depressed by sleep. Bradypnoea describes an inappropriately reduced respiratory rate which can occur when a patient becomes exhausted following prolonged tachypnoea or following ingestion of certain toxins. Cheyne Stokes breathing is an abnormal breathing pattern characterised by progressively deeper and/or faster breathing, followed by a gradual decrease in depth/rate that results in temporary apnoea and is caused by damage to the respiratory centres in the brainstem. Dyspnoea is an overall term used to describe an unpleasant awareness of increased respiratory effort and is used synonymously with breathlessness in this session. The pathophysiology of dyspnoea is poorly understood. Normal breathing is controlled by respiratory centres in the brain stem. The vagus nerve carries efferent and afferent components and provides the pathway for the neurological input resulting in the sensation of dyspnoea. Intrapulmonary parenchymal stretch receptors, carotid body and central medullary chemoreceptors, peripheral vascular receptors and pulmonary artery baroreceptors all contribute to the pathways leading to dyspnoea. Input from these receptors is integrated in the cortical and subcortical respiratory centres. Hypercapnia is well recognised as a cause of dyspnoea; however the relationship between hypercapnia and dyspnoea is not straightforward patients with chronic hypercapnia (eg COPD, neuromuscular disease) may not be breathless at rest. This is because the mechanism is mediated by changes in pH measured in chemoreceptors which can be compensated (eg. by retention of bicarbonate) in chronic disease. There is uncertainty over the role of hypoxia as a cause for dyspnoea(1). Few studies have evaluated the relationship between hypoxia and breathlessness; in one study, patients with COPD had improvement in their breathlessness when given oxygen(2). Despite this, the relationship between dyspnoea and hypoxia is, as with hypercapnia, not straightforward we all have seen patients who are relatively hypoxic and comfortable and also patients who are dyspnoeic but not hypoxic. Afferent information from pulmonary baroreceptors is transmitted in the vagus nerve to the respiratory centres. Pulmonary stretch receptors, for example, are stimulated during lung inflation and provide feedback to terminate inspiration. Stimulation of pulmonary stretch receptors(3) and of mechanoreceptors in the chest wall(4), both of which provide afferent information to the respiratory centres, has been shown to influence the intensity of dyspnoea. Dyspnoea has many causes which vary from benign and innocent to conditions which carry significant morbidity and mortality. Classification can be based upon either (i) the organ system in which the pathology lies (see Table 1) or (ii) the acuity / time-critical nature of the cause (see Table 2). It can be a diagnostic challenge for the emergency physician to determine the primary cause in a patient presenting with dyspnoea because of the broad range of pathophysiology which can produce this symptom. One of the key steps is determining the primary physiological system involved and, in particular, whether it is the respiratory system, the cardiovascular system, neither or both. It has been estimated that 85% of all cases of dyspnoea are accounted for by asthma, cardiac failure, COPD, pneumonia, interstitial lung disease and psychogenic disorder(5). There is a broad range of pathophysiology which can cause dyspnoea; one of the key initial steps for the emergency physician is to determine the primary physiological system involved. The initial approach of the emergency physician to a patient with dyspnoea must be a rapid evaluation of the vital signs following the standard ABC approach to establish whether there is incipient risk to the airway, respiratory failure or cardiovascular compromise that would demand immediate resuscitation (see Figure 1). The physician must perform a primary survey in any patient presenting with significant dyspnoea, immediately assessing the heart rate, respiratory rate, blood pressure, and oxygen saturation, auscultating the chest and evaluating the use of accessory muscles, inability of the patient to speak due to breathlessness, lethargy, agitation, and exhaustion; these features imply impending respiratory failure and the potential need for airway control and urgent ventilatory support (ie. resuscitation). Patients who do not require immediate resuscitation will have their management guided by a more thorough clinical assessment commencing with a focussed history and examination. As stated earlier, the primary question to be addressed during initial clinical assessment in the ED is whether the dyspnoea is primarily of a respiratory, cardiac, or other cause. By using a systematic and structured approach (see Figure 1) to the clinical assessment of a patient presenting with breathlessness a confident diagnosis will be achieved allowing effective management of the underlying condition. Any patient with significant dyspnoea will require a rapid assessment of their vital signs followed by appropriate resuscitation (airway support, supplemental oxygen, ventilatory support, etc.). Abrupt onset of dyspnoea would be typical of conditions such as pulmonary embolism, anaphylaxis and pneumothorax. This contrasts to the more typically gradual onset of symptoms associated with pneumonia, pulmonary oedema or pleural effusion. Symptoms are likely to be of a prolonged duration in patients who have COPD, pulmonary oedema (although exacerbations of these conditions may be acute) in contrast to asthma, pneumonia, anaphylaxis or pneumothorax, where presentation to the ED is likely to be early in the course of the illness. Does the dyspnoea occur at rest or only on exercise? If on exercise, what is the patients exercise tolerance? This may not be specifically diagnostically useful but will be critical in determining the severity of symptoms and the impact that they are having on activities of daily living. A patient who appears comfortable on the examination trolley may actually be severely limited on simply standing / walking or even just talking. A history of trauma will guide the clinician down a different diagnostic pathway compared to a patient with no history of injury. Likewise, a history of allergen exposure or exposure to a family member with infection will be diagnostically helpful. Chest pain is a symptom which often accompanies breathlessness. Description of the character of the chest pain may indicate whether the presentation is due to an acute coronary syndrome (cardiac ischaemic pain), pneumonia or pneumothorax (pleuritic pain), or a pulmonary embolus (atypical or pleuritic pain). The presence of a cough with sputum production may indicate infection; haemoptysis may occur with infection or pulmonary infarction (ie. PE). A history of fever would also indicate probable infection. Polydipsia and polyuria may indicate that apparent dyspnoea is due to an underlying metabolic acidosis associated with DKA. The presence of anxiety or stress may point to hyperventilation as the cause. Is the dyspnoea worse on lying flat? This would indicate that the patient has orthopnoea which is typically associated with pulmonary oedema, and to a lesser extent, with neuromuscular disorders and with COPD. Past medical history and known / established diagnoses are clearly important: a patient with a known history of myocardial infarction is more likely to have cardiac failure, a patient with known asthma or COPD is likely to present with an exacerbation of bronchospasm. Previous episodes of the same presentation can be helpful (eg. pneumothorax). It is also diagnostically important to establish whether certain risk factors exist (eg for ischaemic heart disease, venous thromboembolic disease, COPD, etc). Certain respiratory conditions which present with breathlessness are associated with previous occupational or social activities eg. Farmers lung, asbestosis, bird fanciers lung, etc. The physical examination is the next step in refining the differential diagnosis established after taking a history. There are certain key findings on examination which will be very helpful in establishing a final diagnosis. Certain examination findings upon respiratory system examination, in particular, are diagnostic in the context of an appropriate clinical presentation. Table 3 lists relevant physical signs and their significance in patients with dyspnoea. Table 4 lists the key conditions that cause dyspnoea and their associated symptoms and signs. After taking a history and performing an examination, the emergency physician should have a confident differential diagnosis for the cause of a patients breathlessness. Subsequent investigation will serve to confirm the diagnosis and quantify the severity of the underlying pathology. Most cases do not cause a diagnostic dilemma: the diagnosis will be apparent after the history, physical examination and chest x-ray, with pulse oximetry and arterial blood gas analysis allowing an estimation of the severity of the disease process. Several investigations are available to the emergency physician, some of which are rapidly performed and generic to most patients presenting with dyspnoea (eg. pulse oximetry, arterial blood gas analysis and chest radiography) and some that are directed specifically by findings in the initial clinical assessment (eg. ECG, D-dimer, CT pulmonary angiography). Table 5 summarises the generic investigations relevant to most dyspnoeic patients in the ED with specific comments related to their use. Pulse oximetry provides a simple, accurate, non-invasive and continuous means of monitoring arterial oxygen saturation. Despite its limitations (in comparison to an arterial blood gas assay), it gives immediate information related to oxygenation (and, therefore, hypoxia) and has been adopted universally in emergency medicine, where the early recognition of hypoxia is critical. In addition to identifying hypoxia and guiding subsequent oxygen therapy, it is useful in monitoring changes in a patients condition. Pulse oximetry should be instigated in all patients presenting with dyspnoea, whatever the potential underlying pathology. A number of factors can affect the accuracy of pulse oximetry and it is important to be aware of its limitations. In conditions where the pulse waves have a very low amplitude (eg. hypothermia, hypovolaemia just when you might need a rapid assessment of oxygenation!) readings may be unobtainable. In conditions with abnormalities of the haemoglobin molecule itself (eg. carboxyhaemoglobin, methaemoglobin) pulse oximetry is inaccurate carboxyhaemoglobin, for example, will result in falsely elevated measured oxygen saturation (SaO2). Pulse oximetry is also affected by the ambient light it may not be so reliable outside the ED in the pre-hospital setting. A number of factors can affect the accuracy of pulse oximetry and it is important to be aware of its limitations. The interpretation of ABG assays is outside the remit of this session and is discussed in a specific session on Interpretation of arterial blood gases in the ED. ABG analysis is the investigation of choice for assessment of a patients respiratory and acid-base status. A CXR is the most commonly performed radiological examination in the ED. 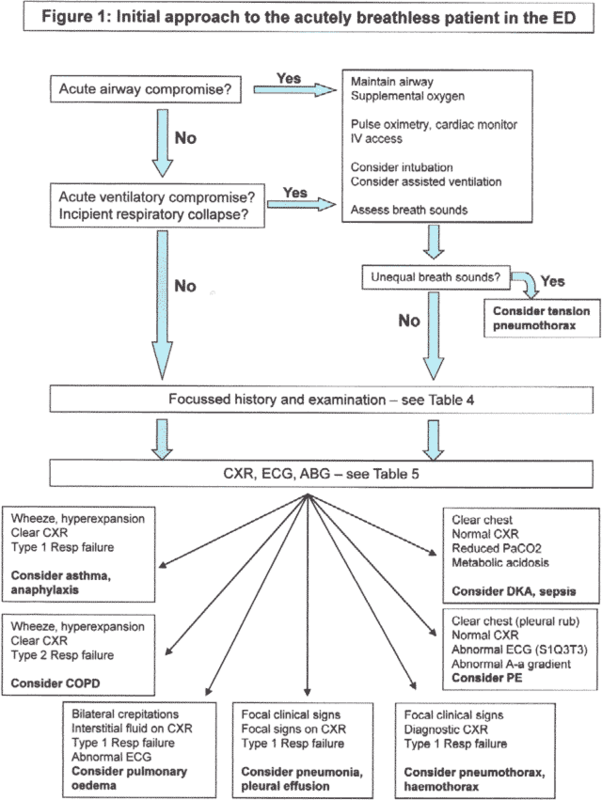 After taking a history and performing a clinical examination, CXR is essential for most causes of dyspnoea both in terms of making a diagnosis and influencing treatment with 63.5% of physicians reporting treatment decisions based on CXR results(5). The prevalence of positive CXR findings in patients presenting with dyspnoea was found to be 56% for patients over the age of 40 years(6); the authors of this study concluded that any patient over the age of 40 who has symptoms or signs of thoracic disease should have a CXR. Specific radiological findings associated with specific pathological causes of dyspnoea are presented in Table 6. Specific interpretation of the ECG is outside the remit of this session; other sessions discuss ECG interpretation generally and specific changes associated with various pathologies. PE is a relatively common condition that needs to be excluded with confidence due to its significant associated mortality if undiagnosed. Unfortunately, the history is variable, and there are no pathognomonic findings on clinical examination, ABG analysis, ECG or CXR. However, information acquired from this initial clinical assessment, considered in association with historical risk factors for venous thromboembolic disorders, will allow the emergency physician to confidently ascribe the patient to a low, intermediate or high risk category(7). Without further investigation, however, patients at low risk cannot be confidently reassured and discharged, and those at high risk should not be committed to prolonged anticoagulation. For patients at low risk, the diagnosis can be confidently excluded with a negative D-dimer assay(8). For patients at intermediate or high risk the diagnosis can be confidently confirmed or excluded with a ventilation perfusion (V/Q) scan or CT pulmonary angiogram (CTPA)(8). A detailed discussion of the diagnosis and management of PE is presented in a dedicated e-learning session. 85% of all cases of dyspnoea are accounted for by asthma, cardiac failure, COPD, pneumonia, interstitial lung disease and psychogenic disorder. Patients who do not require immediate resuscitation will have their management guided by a thorough clinical assessment commencing with a focussed history and examination. Certain examination findings upon respiratory system examination are diagnostic in the context of presentation with dyspnoea. Pulse oximetry provides a simple, accurate, non-invasive and continuous means of monitoring arterial oxygen saturation. CXR is the most commonly performed radiological examination in the ED. After taking a history and performing a clinical examination, CXR is essential for most causes of dyspnoea both in terms of making a diagnosis and influencing treatment. Lane R, Cockroft A, Adams L et al. Arterial oxygen saturation and breathlessness in patients with chronic obstructive airways disease. Clin Sci 1987;72:693-98. Manning HL, Shea SA, Schwartzstein R et al. Reduced tidal volume increases air hunger at fixed P(sub CO2) in ventilated quadriplegics. Respir Physiol 1992;90:19-30. Homma I, Obata T, Sibuya M et al. Gate mechanism in breathlessness caused by chest wall vibration in humans. J Appl Physiol 1984;56:8-11. 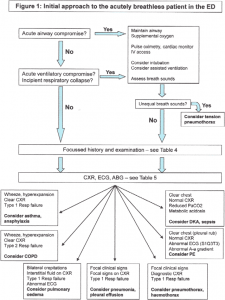 Michelson E, Hollrah S. Evaluation of the patient with shortness of breath: an evidence-based approach. Emerg Med Clin North Am 1999;17(1):221-237. Benacerraf B, McCloud T, Rhea J et al. An assessment of the contribution of chest radiography in outpatients with acute chest complaints: a prospective study. Radiology 1981;138:293-99. Wells P, Ginsberg J, Anderson D, Kearon C, Gent M, Turpie A et al. Use of a clinical model for safe management of patients with suspected pulmonary embolism. Ann Intern Med 1998;129:997-1005. British Thoracic Society guidelines for the management of suspected pulmonary embolism. Thorax 2003;58:470-484.